CD review: "Just Like Old Times"
When it seems that country/western is getting too Nashville, with more polish than soul, along comes a Heather Myles  hailing from nearby Riverside, Calif.  to return us to our roots. Although young, her sound is definitely traditional. That said, she's no throwback, either, being as modern and accessible as contemporary neotraditionalists such as Ricky Skaggs and Jimmie Dale Gilmore. But perhaps Myles would best be compared to George Strait, in that neither has an overly gifted voice, nor is either primarily a songwriter. Instead, like Strait, Myles is a wonderful, improvisational performer. Her covers of "Why I'm Walking" and bluesman Robert Cray's "Playin' in the Dirt" make those songs as much hers as those who made them famous (no mean feat with the former). You've got no place to call your own. 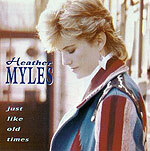 We can only hope that this album is merely the prelude to a long, productive career by Heather Myles.